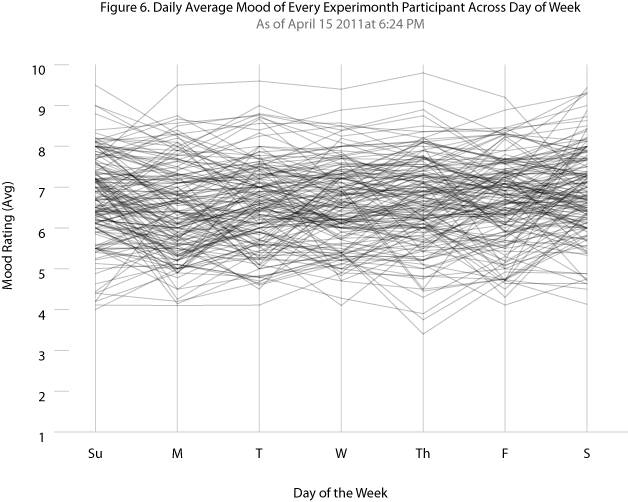 One of the unexpected benefits of switching my phone plan to something that includes unlimited international texting is that I can participate in nifty things like Experimonth, which is a month-long study about moods. I get regular text messages prompting me to rate my happiness on a scale of 1-10, and it graphs it for me. I can probably come up with similar graphs using KeepTrack and a bit of spreadsheet magic, but the convenience and the social data make this fun and interesting. I stay on a fairly even keel, with awesome happy experiences possibly any day of the week. Hmm, maybe I should track text notes too, so I can get a better handle on what causes the 10s or the 6s. It might also be interesting to combine the happiness ratings with my time analyses to see if there any correlations.